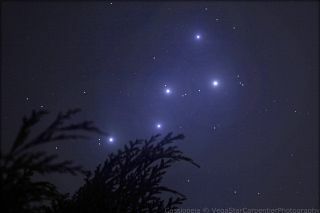 VegaStar Carpentier took this image of the constellation Cassiopeia from Reims, Champagne-Ardenne, France on Oct. 22, 2012. Carpentier used a Canon EOS1000D at 300mm to capture the image. In our current evening sky we have one of the earliest soap-opera-like stories, with two independent plots becoming intertwined into one. The most prominent character in the story can be found once darkness has fallen around 8 p.m. local daylight time, halfway up in the northeastern part of the sky: The zigzag row of bright stars that make up the constellation of Cassiopeia, Queen of Ethiopia, wife of Cepheus the king and the mother of the beautiful Princess Andromeda. When two fainter stars are added, the seven together appear to outline Cassiopeia’s chair or throne which was set close to the pole of the sky. Cassiopeia and Ursa Major (the Big Bear) appear to whirl around opposite to each other from Polaris. In the fall and early winter evenings when the Queen is high, the Bear appears to be hibernating near the northern horizon. Cassiopeia’s husband, Cepheus, the King of Ethiopia, seems to actually resemble a church with a steeple or perhaps an Alpine ski lodge with a steep, snow-shedding roof. To save Ethiopia, Cepheus followed the advice of the oracle of Ammon in Libya and chained his daughter, the Princess Andromeda, on the rocky shore as a sacrifice. As Cetus approached, however, Perseus appeared on the winged horse, Pegasus. He was returning from a mission to slay the Gorgon Medusa, who had snakes for hair and whose hideous gaze turned everyone it landed on into stone. Perseus removed Medusa's severed head from his pouch and held it front of Cetus, petrifying him. So Andromeda was saved and became betrothed to Perseus. Depending on your point of view, Perseus resembles either a lopsided letter "K" or a fleur-de-lis low in the east-northeast part of the sky. Pegasus, meanwhile, is distinguished by four bright stars high in the east-southeast, better known as "The Great Square," marking the torso of a imaginary winged stallion which, according to the ancient stargazers, is actually flying upside-down in our autumn skies! A galaxy gar, far away . . . But it is the Princess Andromeda that contains the most intriguing of all of the deep-sky objects — the famous Andromeda Galaxy. Andromeda consists of two strands, each containing four stars with both strands connected to the upper left corner of the Great Square at the bright star Alpheratz. One of the strands consists of moderately bright stars; the other is made up of stars that are moderately faint. The fainter strand lies above the brighter one, and just above the midpoint of that fainter strand is where the galaxy happens to be. Now known to be some 2.4 million light-years away, the Andromeda Galaxy is a spiral system quite similar to our own Milky Way, though probably a little larger and more populous. If you are fortunate enough to be under dark skies free of light pollution, you’ll readily be able to spot the galaxy with the unaided eye as a small elongated smudge of light; with modest optical aid, it becomes a larger, more prominent smudge. What you’re seeing is the galaxy’s bright hub, which, typical of spirals, is more luminous than the spiral arm regions. Under good skies, you can glimpse the considerably fainter, somewhat smoky-looking arm areas flanking the galaxy’s prominent core. When you see it tonight, consider that this light has been traveling some 2.4 million years to reach you, traveling all that time at the tremendous velocity of 671 million mph (1.08 billion km/h). When it began its nearly 15-quintillion-mile (24 quintillion km) journey earthward, mastodons and saber-toothed tigers roamed over much of pre-ice-age North America and the human species' hominid ancestors struggled for existence in what is now the Olduvai Gorge of East Africa.